What happens when you take a wide-eyed preacher's daughter from Texas "across the pond" to the multicultural lawns of Oxford? 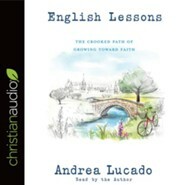 With winsome honesty, Andrea Lucado relives the year she spent navigating the Thames river, romantic relationships, the university's atheist society, and a coffee-less Lent---and searched for answers to the universal questions of identity and belief. Hardcover. It wasn't long after arriving in Oxford for graduate school that twenty-two-year-old Andrea Lucado  preacher's daughter from Texas - faced not only culture shock, a severe lack of coffee, but also some unexpected hard questions: Who am I? Who is God? Why do I believe what I believe? "So many nights in Oxford, I felt like the details of my faiths were getting fuzzier. Nights turned restless with the questions and the thoughts. I questioned God's existence and the doubt, it was getting into my bones." When Andrea arrived in England the year after she graduated from college, she expected to meet God there. What she didn't expect was that God would be much bigger than she knew. In English Lessons, Andrea takes us through the roads of England and the paths of the soul. Here she explores the journey of a changing faith and an unchanging God—and why growing up starts with realizing just how small we are. 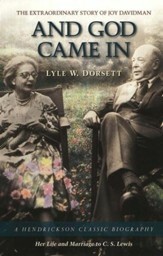 "Luminous patience and insight lights these uncommonly thoughtful pages. Andrea Lucado is a winsome, wise, and unwaveringly honest companion for the wonderer and wanderer, and the lines on these pages offer a tangible lifeline to every God-wrestler. These are pages that are hard to put down, that you will want to return to and reread. Andrea not only offers a genuine way to love the questions themselves, she offers an authentic way to love the Answer Himself." "This book brought me right back to a younger selfa bookish pastors daughter living abroad, making sense of her faith, of the world and her place in it. Andrea is a lovely writer, and this story will make you ache for the feelings and memories and experiences of your early twentiesboth the wonderful ones and the challenging ones. And it will make you want to go to Oxford, of course." "To have a strong faith we can stand on, we all need to wrestle well with hard questions and come face-to-face with our gut-honest feelings. Andrea does this in such a tenderly beautiful way that will leave the deep parts of your heart feeling comforted and understood." "English Lessons is positively paradoxicalboth mature and youthful, entertaining and challenging, full of light and full of depth. 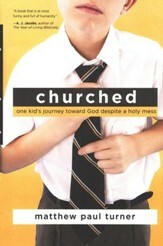 Written by a pastors daughter, it is the perfect book for those trying to own a faith handed to them by someone else. Whether youre a spiritual seeker or a hardened skeptic, this book will both honor your doubts and open your heart to grace. A wonderful paradox, indeed!" "In English Lessons we discover an honest voice exploring life and love, finding that its okay and even common to not know where the journey will take you. Andrea Lucados memoir is a story of love and friendship, saying goodbyes, and seeing yourself in a mirror to find out more of who you really are, perhaps for the first time. 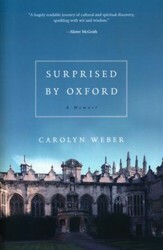 Her year in Oxford was a wide-open space for a life of grace." 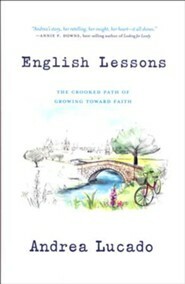 "English Lessons is one of those beautiful books that you can just fall into. Andreas story, her retelling, her insight, her heartit all shines. I love this book, I learned from it, and I cannot wait to read it again." "In this vivid and vulnerable memoir, Andrea Lucado allows readers to experience both the charms and the challenges of living in a foreign place. Anyone who has had their faith stretched to a near-breaking point will feel themselves walking with Andrea next to the River Thames, staying up late talking theology with a new friend, and facing the discomforts of a chilly English winter. Andreas story gives readers permission to have faith like a child, questions like a teenager, and steady trust like an adult. If you want your own faith to grow and to grow up, this well-rendered story is for you." 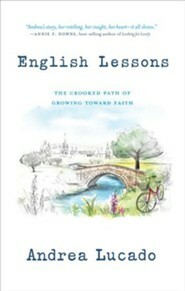 I'm the author/artist and I want to review English Lessons: The Crooked Path of Growing Toward Faith.